Experience the fragrance of rich, romantic love. Oilily has launched Lucky Girl (shown above right), a romantic fresh floral for 'girls who enjoy life'. 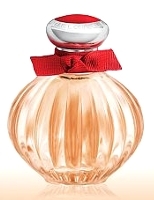 The notes feature mango, apple, melon, berries, orange, white roses, lilac, musk and amber. That is the bottle for Tocca Touch. Did they learn nothing from the Twilight/Nina debacle? This is their 3rd fragrance in that bottle, so guessing they don’t care…but beyond that, surely Tocca wasn’t the first to use this basic bottle shape? Although can’t think of who was! Just doesn’t seem all that unusual. No, you’re quite right; it’s an old idea. (Lalique had a squat variant of the design in the 1920s, and it’s surely older than that.) It’s just that when I saw it, I assumed it was Tocca Touch, and was rather surprised to find out that it wasn’t. It’s a good thing Ashley Judd was there to point out the blinkin’ obvious. It’s sort of shocking how little effort is put into promoting this perfume. Two lines of copy, no notes, no fragrance description, nothing. I think it’s a safe bet that the kind of person they are aiming this at, based no doubt on market research, doesn’t care about such things. Such a shopper doesn’t have a big fragrance collection, doesn’t read about perfume, doesn’t care about the advertising bumf: she will see Ashley Judd, give the bottle a quick sniff, maybe spritz her wrist, and toss it in her cart if it smells agreeable and if the price is right. (And there’s nothing wrong with this.) It will surely sell like gangbusters. You know, I can’t disagree, but surely somebody in the American Beauty headquarters could spare 10 minutes to write, say, 4 or 5 sentences describing it? And maybe list the notes? More & more people are buying perfume online & so never have the chance to spritz the tester. And bandwidth is not expensive. So why not? If it sells 3 more bottles of perfume, it’s worth it. This is the same sort of description Avon uses, and I just find it puzzling. It’s like they don’t want to sell online at all! Fragrance writing… why won’t people indulge in it for a living when the rest of us so badly want to?!? Also, and I say this as someone who deeply loves rose scents, I find a hand-picked bouquet of wildflowers to be 800% more romantic than a red rose, mostly because of the effort required to obtain such a thing. Sorry, Ms. Judd. I wonder how much Oilily paid someone to come up with the phrase “for girls who enjoy life”?!! At least they said something! And they said much more than that, but since the original is in German, it’s all I can come up with. Nothing is as boringly obvious as a red rose, I would have said. About as special as a box of cheap candy. Are those ornaments on the Oilily bottle, or cloth capes or dresses? Both! And you can switch them around. Tee hee. Funny, it doesn’t look like a doll so much as one of those old plaster saints that they dress up. I’m assuming it’s geared towards young girls…and so is perhaps kept light for that reason? On the other hand, brands seem to ignore the seasons more & more these days. “The fragrance opens with apricot nectar, nectarine and sparkling pink grapefruit – hand-blended to form a synergy between bright and playful innocence and a charming allure. At the heart of the fragrance is Bulgarian Rose surrounded by rich tuberose, purple orris and creamy gardenia petals into a radiant and ravishing bouquet of romantic florals.